﻿ Lareem Boutique Hotel, Jeju Island | FROM $43 - SAVE ON AGODA! 4 travelers have booked today. Have a question for Lareem Boutique Hotel? 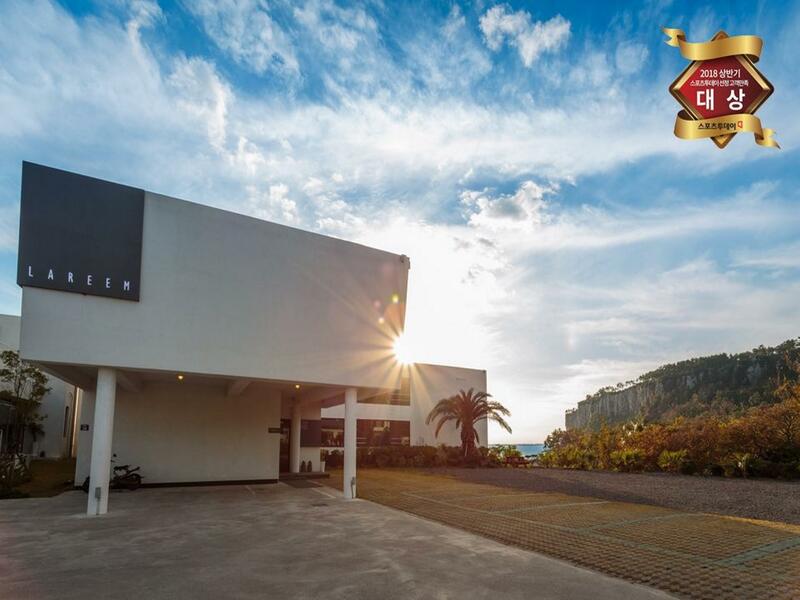 Well-placed in the family fun, beaches, sightseeing area of Jeju Island city, Lareem Boutique Hotel provides a most conducive spot for you to take a break from your busy days. The hotel lies 15vkm from the city center and provides accessibility to important town facilities. No less exceptional is the hotel's easy access to the city's myriad attractions and landmarks, such as Hyatt Hotel Casino, Jeju Shilla Hotel Casino, Jungmun Golf Club. Lareem Boutique Hotel also offers many facilities to enrich your stay in Jeju Island. Top features of the hotel include free Wi-Fi in all rooms, express check-in/check-out, luggage storage, Wi-Fi in public areas, valet parking. The hotel features 23 beautifully appointed guest rooms, many of which include television LCD/plasma screen, internet access – wireless (complimentary), air conditioning, heating, desk. Whether you're a fitness enthusiast or are just looking for a way to unwind after a hard day, you will be entertained by top-class recreational facilities such as golf course (within 3 km), fishing. When you are looking for comfortable and convenient accommodations in Jeju Island, make Lareem Boutique Hotel your home away from home. Breakfast is served from 08:00 AM to 10:00 AM. The cleanliness, the toilet facilities and quiet location and fresh air. the access to the hotel is a real challenge; with cars parking sometimes on both sides of the already narrow road. It is quiet with some good black pork barbecue food stall within walking distance. The toilet facilities is comparable with some good 4 to 5 stars hotels. not a high-end hotel but it has a nice design hotel in well managed condition. i will recommend to everyone who doesnt want to stay in crazy crowded area. Near beach , lots of eating place and friendly staffs . 생각보다 실내가 넓고 예쁜 호텔입니다. 전망도 박수기정과 바다 그리고, 밭들도 보여서 너무 좋았어요. 또한, 일몰이 너무 예뻤습니다. 침구도 깨끗했고 쾌적했어요. 단지, 처음에 한쪽 화장실에서 하수구냄새가 올라와서 좀 그랬는데... 사용을 하면 할수록 냄새가 줄어들었습니다. 외출하고 돌아오니 청소가 되어있어서 좋았습니다. 미리 신청을 하지 않으면 청소를 안해주는 곳도 있어서요~ 동네도 조용하고 아기자기한 카페들이 있어서 천천히 둘러보며 산책하기 너무 좋았습니다. 아이들은 강아지들을 어찌나 좋아하던지요~ 와이파이가 시원하게 잡히지 않는것과 치약이 없어서 당황한 것 빼놓고는 좋은 숙소였습니다. 조식은 안먹어서 모르겠구요~ 다음에 다른 일행들과 다시 한번 묵고싶은 호텔입니다. 1년 전 제주도 한달살이를 하면서 구석구석 돌아다니다가 알게된 동네에서 발견한 숙소입니다. 그때는 호텔안에 있는 까페 옥상테라스의 차양소파와 경치에 함께 반해서 다음에 제주도 오면 호텔에도 꼭 묵겠다고 생각하다가 이번에 오게 되었습니다. 3명이서 30평 오션스위트를 썼는데 머물기에 충분히 넓고 고급집니다. 방 바로 앞에 초록의 논이 보이고 그 뒤 아래쪽으로 이국적인 디자인의 건물과 함께 펼쳐지는 바다경치와 오른쪽의 주상절리 절벽 경치는 오히려 신라, 롯데호텔보다 훌륭했습니다. 같이 갔던 친구들도 평소엔 서로 좋은말 잘 안해주는데 제주도에 이런 위치에 이런 경치를 볼수 있는 숙소가 어떻게 이런 가격에 있냐며 인정해줬네요 ㅎㅎ 경치와 한적함, 호텔 앞 바닷가에서 보말등도 체취할수 있고 운좋으면 물질하고 올라오시는 해녀를 만나 해산물도 싸게 살 수 있는 점 등에서 개인적으로 위치도 최고점을 줬습니다. 다만, 마트, 식당등의 편의적인 부분을 위치상 중요시하신다면 시내나 중문 중심가는 아니니 참고하시면 좋을듯 하네요. 그래도 중문까지 차로 10분 안걸리는 거리에 있습니다. 참고로 일행 한명이 늦게 합류했는데 공항서 검색해서 버스로 한번 갈아타고 1시간 정도만에 올수 있는 대중교통도 편한 곳이었습니다. 프런트에는 주인 혹은 매니저로 보이시는 분이 계신데 대형호텔 직원같이 상냥하게 해주시는건 아니지만 친절하게 필요한 부분 잘 설명해 주십니다. 편의시설도 옥상테라스는 무조건 추천드리고, 까페엔 식사메뉴도 맛있습니다. 동네슈퍼, 바닷가가 도보 10분 이내 거리고 주변에 식당도 두어군데 있었습니다. 시설상 딱 하나 개인적으로 아쉬운점이 있다면 제가 즐겨하는 자쿠지는 없다는 점 정도였습니다. 화장실 자체는 아주 넓고 욕탕도 있긴 합니다만 뷰를 즐기며 할 수는 없었습니다. 제주도를 많이 좋아해서 1년에 2-3번 다녀오는데 여러모로 봤을때 이런 가격에 이런 경치와 시설을 누릴 수 있는 곳은 손에 꼽힙니다. 추천드리고 싶네요. 2박3일 가족여행 이었습니다. 숙소는 넓었고 깨끗했습니다. 위치도 괜찮았습니다. 바다와는 거리가좀 있었으나 바다도 바로 보이는것도 좋았습니다. 제느낌으로는 리모델링 시기가 오지않았나 생각합니다. 관리나 청소상태는 좋았으나 오프한지 1~2년된 숙소보다는 아쉬운점이 좀 보였습니다. 하지만 가격대비 전체적인 부분은 만족합니다. 대평리를 예전에 와보고서는 라림부티끄 위치가 숙소중에 제일 낫다고 생각해서 이번 제주여행땐 미리 묵을 계획을 하고 예약했어요. 아이 동반이라 더블+싱글 조합이라 딱 맞다 생각했고 박수기정이 바라보이고 바다가 보이는 정면 측면 뷰가 예술입니다. 룸컨디션은 깨끗한 편인데 바램이 있다면 조금 더 따뜻한 느낌이 들면 좋겠고 전반적으로 묵은 내음이 나는 것 같아서 향 관리를 해서 룸에 들어설때 상쾌하고 릴렉스할 수 있는 편안함이 있으면 좋겠어요. 부모님과 동생이 제주도로 여행을 오게 되어서 집근처로 검색하다가 알게되어 스위트오션룸으로 예약했는데 생각보다 훨씬 분위기가 좋았어요. 대평리자체가 조용한 동네라 전체분위기도 평온하고 룸에서 보는 바다뷰와 루프탑에서 보이는 바다뷰는 더할나위없이 좋았구요. 밤늦게 호텔로 돌아와서 전자레인지사용을 위해 프론트에 부탁드렸었는데 카페가 문을 닫은 시간임에도 불구하고 직접 음식도 데워주시고 밥까지 챙겨주시던 친절과 배려 너무 감사했어요. 다음 여행때도 무조건이에요 ㅠㅠ 청결 굿 경치굿 저만의 아지트가 생긴 기분이랄까요 ㅠㅠ 저민 알고픈 숙소예요 이곳 주변 숙소중에서도 젤 예쁘고 산책하듯 3분만 걸으면 박수기정에 그냥 발코니 열면 뷰가 장난아닙니다 ㅠㅠ 2층에 있는 카페에 조식도 먹을만하고 너무 이뻐요 3층 루프탑에서 사진찍으면 인생샷 건져요 넘 예쁜 마을에 좋은 숙소까지 다음 제주여행때 또오기로 했어요^^ 가격도 굿입니다! !